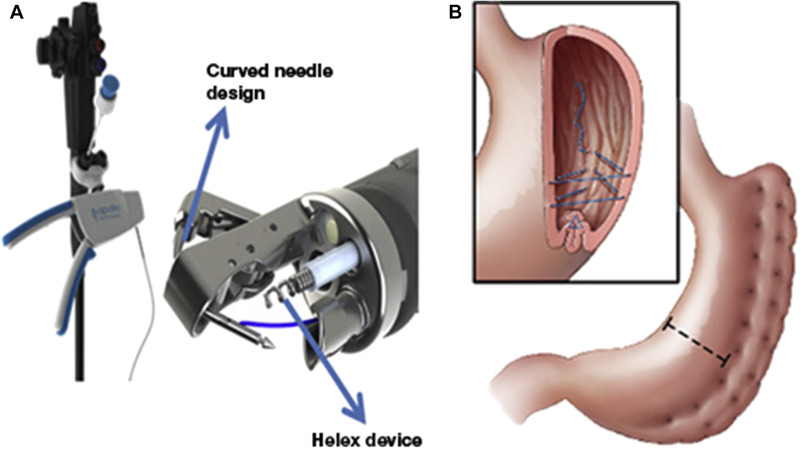 Endoscopic sleeve gastroplasty (ESG) delays gastric emptying, induces early satiation, and significantly reduces body weight, researchers report in the January issue of Clinical Gastroenterology and Hepatology. ESG could therefore be an alternative to bariatric surgery for some patients with obesity. Although bariatric surgery is the most effective therapy for obesity, only 1% of qualified patients receive the surgery because of limited access, patient preference, risks, and cost of surgery. ESG is a minimally invasive procedure in which a full-thickness endoscopic suturing device is used to reduce the size of the gastric reservoir. The procedure is minimally invasive and peformed under general anesthesia, occasionally with an overnight hospital observation stay. ESG was devised to endoscopically achieve a change in the gastric anatomy similar to that achieved with laparoscopic sleeve gastrectomy, but without surgical resection of the fundus or body of the stomach (see Figure). Barham K. Abu Dayyeh et al performed a clinical trial (NCT01682733) to assess the durability and effects of ESG on body weight and gastrointestinal function in 25 obese individuals (21 female; mean body mass index, 35.5 ± 2.6 kg/m2; mean age, 47.6 ± 10 years). In the study, the patients underwent ESG with endoluminal creation of a sleeve along the gastric lesser curve and followed for a median period of 9 months. The authors found that subjects had lost 53% ± 17% of excess body weight at 6 months after the procedure, and maintained a 45% ± 41% loss of excess body weight 20 months after ESG. Endoscopic analysis at 3 months after ESG showed intact gastroplasty in all subjects. Calorie intake to reach maximum fullness in a liquid meal test decreased by 59%. The subjects stopped eating their meal after 11.5±2.3 minutes, compared with 35.2±9.9 minutes before they underwent the procedure. 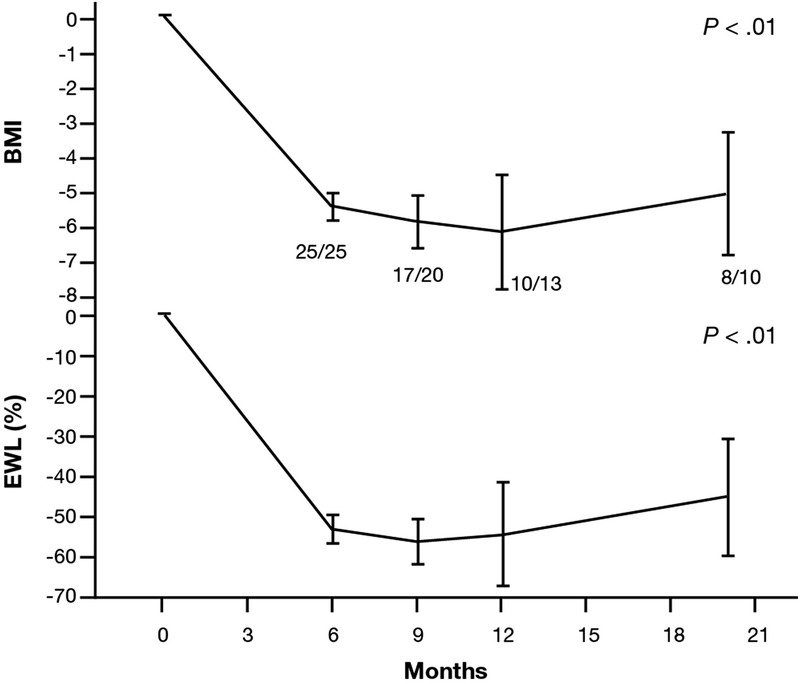 Three months after ESG, subjects had a significant delay in gastric emptying. The time required for 50% gastric emptying of solids increased by 90 minutes, compared with before ESG. Despite significant weight loss, active fasting and post-prandial ghrelin levels decreased by 29.4%. Three patients had serious adverse events (a perigastric inflammatory collection, a pulmonary embolism, and a small pneumothorax) but made full recoveries with no need for surgery. No further serious adverse events occurred after the technique was adjusted. Abu Dayyeh et al compared their outcomes with findings from a study of 30 patients in Spain who underwent the same procedure. Overall, the patients in Spain lost a mean 56.4% of excess body weight—similar to the findings of Abu Dayyeh et al. The authors explain that for endoscopic bariatric therapy to have a meaningful effect on obesity, it should reach a threshold of efficacy that is balanced with risk and cost of the intervention. They state that ESG is well tolerated as an outpatient intervention, requiring less than 2 hours of endoscopy time. It has a short initial learning curve and can be performed by using standard off the shelf endoscopy tools. The recovery period after ESG is short—most patients are fully functional within 1–3 days after the intervention. Due to the significant amounts of weight patients lost, the reproducibility of the results at an independent center, and the anatomic durability of the intervention, Abu Dayyeh et al conclude that ESG is a cost-effective intervention for obesity. They add that ESG might be a reversible and repeatable procedure. In an editorial that accompanies the article, Shelby Sullivan and Steven Edmundowicz state that further studies of more subjects are needed to validate these small pilot data. They point out that the patients included in the study had on average lower body mass index than patients undergoing sleeve gastrectomy, making true comparisons between the 2 procedures difficult. Other limitations of study include the lack of a control group and limited long-term follow-up time. This technique is new, but might be used to treat obese persons who do not undergo bariatric surgery, including those of moderate obesity or require a bridge to surgery, including super-obese individuals.